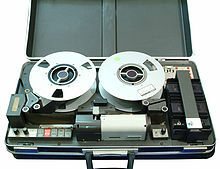 Ampex VRX-1000—The First Commercial Videotape Recorder. Charles P. Ginsburg, The Birth of Video Recording. Sony sold 15,000 U-matic machines in the U.S. in its first year. "Television on a Disk," Time, Sep. 18, 1972. Jen Chaney, "Parting Words For VHS Tapes, Soon to Be Gone With the Rewind," The Washington Post, August 28, 2005; p. N01.